The O'Connor clan thinks they know Emma Malloy. After Charity O'Connor Dennehy rescued her from an abusive husband, the family embraced her as one of their own. She holds firm to her vows, but love ambushes her from an unexpected source. Sean O'Connor, the oldest O'Connor sibling, is a dyed-in-the-wool bachelor. When Rose Kelly sets her sights on him, he's faced with the fact he's not so impervious to female charms. The only woman he feels comfortable with is Emma, a good friend and confidante. Since both these characters appeared in Julie Lessman's other books, I thought I had quite a bit of information on their backstory. Well, let me go on record: I was wrong. The straightforward facts took some intense and surprising turns. While I caught one little clue that Julie dropped during the story, it wasn't enough to give me the full picture about Emma. Toward the end of the book, my bedtime came and went. I couldn't wait to see the ending. If you've read any of the author's other books, you know she's heavy on the romance. Yet, while she's realistic, she's careful with her descriptions. Her stories have a strong moral compass, as well as spiritual themes. Even when her characters mess up, they understand the consequences and see that God's ways are better than our ways. I'm curious who will be the subject of Julie's next novel. My guess is Steven, the younger brother. Once she goes through all the siblings, I wonder if she'll start writing about the grandkids. Hmm, maybe it's time to invite Julie for another interview. What do you say, Julie? If edgy romance is your genre, you'll love all of her books. Have you read any Julie Lessman books? Which one was your favorite? Hahaa, I LOVED the twist at the end of Revealed. It was perfect. I'm interested in seeing what she'll write next too. This sounds great. I haven't read any of hers, but I took one of her classes at ACFW and heard her reading parts of this one, and it really sounded fantastic. I pray you had a relaxing Christmas and New Year. I haven't read any of Julie's books. But I do like how you mention that the characters mess up, and then learn God's ways are better. Any story that exemplifies following God's way as the right way, and HIs grace when we mess up is a good story. 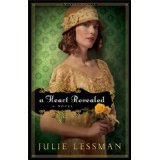 Julie Lessman is one of my favorite authors! This book looks especially intriguing--thanks for the review, Susan. I don't consider her edgy, though. I think of Patti Lacy and Kathi Macias when I hear the word "edgy." Thanks for your review Susan, I still don't know how you manage to read so many books :) but I always appreciate your musings. Hi Jess - Me too! Hi Kristen - Ooo, how exciting that you got to sit in one of her classes! Christmas and New Year's were hectic but lots of fun. Hi Lynn - Yes, it's one of the reasons I like her books. Hi Jen - A lot of people consider her edgy because of how she handles romance. Hi Marja - I try to read one book a week, but don't always succeed. Author interviews fill in the gaps, as well as provide a window into their writing lives. Hi Diane - You'd enjoy her books. For anyone who hasn't read them, I suggest starting with her first novel. You don't want to miss any part of this saga. Ooooh, I'm so glad I found your blog because I was just looking for some book recommendations. I got a Kindle Gift card for Christmas and need some new stuff to read. Thanks! I've not read this one yet. Thanks for the scoop! :) I'm thinking I need to pick this one up. I think I have read one of her books and did love it. My daughter reads her. You give great feedback on author's work! Hi Sarah - Have you read her other books? You'll enjoy those as well. Hi Erin - Welcome! I do book recommendations and author interviews on Wednesdays. You'll find other books if you scroll back in the blog. Hi Karen - Big surprise at the end! Hi Terri - It amazes me how Julie keeps track of all those characters. As writers, we can learn so much by reading well-written fiction. I haven't read this author, but her books sound amazing!